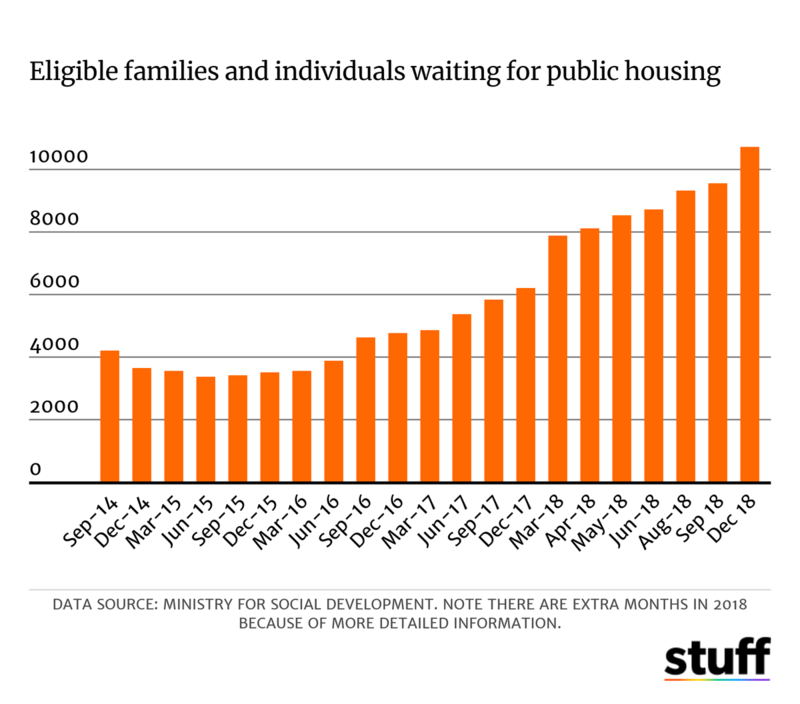 The waiting list for public housing has doubled over the past two years, increasing substantially since the Labour-led government took over in late 2017, despite Labour promising to increase housing stocks and decrease waiting lists and homelessness. The suspension of tenancy reviews, and landlords selling up and getting out of supplying rental housing, have both been blamed. The public housing waitlist has rocketed past 10,000 as more people wait longer for public housing. At the end of 2018 fully 10,712 eligible households were waiting for state or social housing – 73 per cent more than a year ago, and over three times the number waiting at the end of 2015. The vast majority – 78 per cent – were deemed as “priority A”, meaning the Government believed they were the most in need of help. Almost half were in Auckland. This is despite the Government building 1658 new public housing places over the last year, the largest increase in a decade. Ministry of Housing and Urban Development officials blamed higher rents, greater awareness of public housing, and a slowdown in the rate of people exiting public housing for the increase. Housing Minister Phil Twyford said concerted effort over “many years” would be needed to fix homelessness. He didn’t say that during the election campaign in 2017. Twyford paused “tenancy review” last year – the process by which Housing New Zealand check whether a tenant is still eligible for a state or social home. National housing spokeswoman Judith Collins vigorously criticised the move, but Twyford said previously that it had not contributed significantly to more people staying on in state homes – only around 200 households would have been up for review during the pause. Tenancy review resumed on Monday with some changes: any family with children or someone over 65 is now exempt. Emergency motel stays were on the up too. In the three months to the end of 2018, 15,676 emergency housing grants for motel stays were granted -up from 14,000 the quarter prior. These went to just under 2700 individual clients – with many taking multiple grants. This was up from 2585 in the quarter prior. Collins said Twyford’s multiple reforms to private rental market – both enacted and promised – had driven up rents as landlords were selling up and getting out of the business. “Landlords are leaving the market in droves. The Government in its steps to try and attack landlords has actually sent a whole lot of people out of that market and that means that there is now more people wanting public housing,” Collins said. Twyford received advice last year from officials saying rents could rise as the result of his reforms to tenancy laws thanks to landlords feeling like they were under assault and selling up to owner-occupiers, who generally have less people in each house than renters. “While these effects should be minor, the cumulative effect of changes to the Residential Tenancies Act 1986 may lead landlords to perceive the effects as more than minor. As a result, even if legislative changes did not materially affect the financial returns of landlords, some many nevertheless choose to sell their rental properties,” the officials wrote. Twyford’s changes included ending letting fees and increasing the quality of rental properties via the Healthy Homes Act. Sorting out major housing issues was never going to be quick or easy. The National government were perceived to have dropped the ball on housing, and also on RMA reform (which would have made it easier and cheaper to open up land for development), leaving Twyford and the incoming government with huge problems too deal with. If anything Twyford has managed it worse than National. Ricardo Menendez March from Auckland Action Against Poverty, thinks resources have been wrongly allocated. Mr Menendez March said not enough is being done to solve the issue and the Government needs to focus on action. He said that more needs to be done to improve the unaffordable private rental market too, including regulation. Think of a CoHousing development as being more like a “high-functioning neighbourhood”. That was the description used by Nicci Amour at the first CoHousing Hui for Collective Urban Housing in Aotearoa, which was hosted by Victoria University of Wellington, Enspiral, a global network committed to positive social and environmental impact, and Parsonson Architects. The event was supported by Dux Financial Services, Wellington City Council and the Ministry of Housing and Urban Development. Amour is part of Closer Developments, a Tauranga social enterprise using a shared resource model “to provide affordable housing solutions through building connected communities, not just houses”, starting with a pilot project in Katikati. “There’s a significant mismatch between the type of houses we need and those that are being built, not to mention the price they are costing us,” Amour told a packed audience of practitioners and would-be practitioners at various stages of their CoHousing journey. Twyford: chief drivelling idiot in charge of housing. What could possibly go wrong? You have Twyford as the chief drivelling idiot in charge of housing. There is a certain beauty when a drivelling idiot is sent to sort out a problem of multifaceted complexity created by many geniuses in their little fields, many of whom have one prime aim: to make money. Not hard to fix, duperez. Smash the bureaucracy out of the way and let the market do it. Only problem is a massive pile of deadbeat environmentalists and socialists protecting the bureaucracy and a lot of their own make-work jobs. show some evidence that landlords are selling up en masse….more b/s . caused the housing crisis and they and their supporters need to STFU. Rents are rising, waiting list is getting longer, population increase slowing rapidly, percentage of new lending going to investors sharply down are pretty good indicators labour has exasperated the problem Blazer. Anecdotally from property managers there are a few more getting out but there are a lot less getting into it. Politically I am sure that pleases you but there is harm caused by lack of supply as you so frequently point out as Nationals failure..well its surely the same principal at work. only speculators would view these as negative. You are forgetting the figures showing waiting list figures are now more accurate. The last administration…never had the data! Knocking over and selling off state housing,exacerbated the problem. A few years down the track the Col govts initiatives will have effect. Most investors aren’t speculators Blazer , by conflating the two we end up with sub optum policy decisions s with poor outcomes for renters. How much you make from rent vrs how much you make from capital gains? Being a land lord not risk free so you should be looking at at lest a 6% return after outgoings and the opportunity cost of your investment. Yet your average rental will not even cover your cost of lost opportunity of the investment. The New Zealand rental market is based on capital gains… that is speculation. When we next have a property down turn watch landlords go bust by the thousands ….. again. No it isn’t speculation. The rental market was competitive and set rates according to costs and benefits including expected capital gains. Enter Labour hell-bent on vilifying and penalising landlords and the market has reacted as was inevitable but of course completely denied by the loony Left including as ever the interminable and ineducable B. No it isn’t speculation. The rental market was competitive and set rates according to costs and benefits including expected capital gains. A market with no added value reliant only on ever increasing capital gains is by definition speculative. I can think of more than one way for the bubble of house price inflation to burst . Retiring boomers trying to cash out. Ps in my comment above I double counted opportunity cost . I give all of us a d -. I live in Christchurch and we havent had capital gains in 4 odd years. I have never invested for capital gain I am a cashflow kinda guy. That isn’t the housing market. First, housing has a utilitarian value. Second, landlords don’t rely on ever increasing capital gains. They set their rents based on current expectations and modify the former as the latter change. That is exactly what is happening now. stick to lemon juice Al. Its a rigged market that needs the Govt to pump in $2.5000.000.000 in accomodation subsidies to maintain it. No it doesn’t need that. It merely reacts to it accordingly. Stick to your economic fantasies if you wish but don’t expect any respect for them. why are you worried about the 5 year brightline? I think the original purpose was justified as the tax law was pretty grey and 2 years seemed appropriate especially given the Auckland market at the time. 5 years is a CGT in disguise, a lot can change in 5 years including quite a bit of inflation so the tax is a little stealthy as well. I think in Australia if you keep a property for a year then the CGT only applies to 50% of the gain and then it reduces rapidly after that. The UK has a generous annual allowance you can accumulate as does the US. so you are building 3 new houses in Christchurch!!>??? “show some evidence that landlords are selling up en masse….more b/s . This is nothing more than you howling at the moon. produce the evidence then…so many Davids….running out of….shot. Two is a big number. I care about the homeless and unemployed so I’m voting Green-Labour and … wait…. what? If progressive government is about anything, then it’s first and foremost about constantly expanding the number of citizens in good jobs with good pay. Any progressive government confronted with a steadily rising tide of joblessness should expect to drown. Maybe we should just hire Maduro and get it over with. According to all the Lefties I know he really cares as well, which is why he supported all those wonderful Left-wing ideas on housing, jobs, etc, etc. Oh – and just have Twyford shot because incompetence is the real problem here, just like it is in Venezuela, Cuba, North Korea,…. Yeap, the ideology is imperious to reality. New Zealand actually has an over abundance of housing. 75% of houses have less than 3 people in them. We also have vast numbers of empty office and unused commercial building space. We could double our population tomorrow and still have heaps of empty building space. Auckland has over 33,000 empty houses.Subtract those empty for a genuine reason…and the remainder would almost solve the…shortage. Show us the data you have on how many are empty for a ‘genuine’ reason. I don’t have that data. A reasonable basis for comparison…not forgetting Aucks should be worse as foreigners cannot own houses in Oz. A lot of empty office building office space on The Terrace was converted to apartments a couple of decades back. One of the buildings we worked in for about 6 years (owned by Bob Jones at time) needed expensive earthquake-proofing & exterior remodelling work done first. He spent nothing on it and flogged it off to new owners who spent a fortune on the damn place – and have recently had to spend a fortune on it again replacing all the dangerous balconies they added, I understand. Sometimes there’s an expensive reason office buildings are vacant. It’s not double standards. Labour and its sidekicks opposed the necessary reforms when National was in Government and continues to oppose them. National did not have a majority to carry out the reforms when it had the opportunity. And before you say it did in its first term it was dealing immediately with the GFC and subsequently with the Chch earthquake. You probably are, PZ. I know, while dealing with collapse of the global financial system, building and finance industry followed by the destruction of your second biggest city – its entire commercial centre and thousands homeless – let’s completely redesign our local government planning and building regulatory system. What kind of communication lines do you have to planet earth? Isn’t that more-or-less what they did in Chch? Still, it’s good to know what you mean by “RMA reform”. 1: Property rights should be enhanced to protect owners from neighbouring infringements to the peaceful enjoyment of their property but otherwise belong to owners not bureaucrats and politicians. 2. Councils should be responsible only for health and safety of buildings, not quality and durability. Who should be responsible for quality and durability and how should that be ensured before construction even begins and afterward? There’s quite a lot to be said for it … although nothing absolute. If Councils should be responsible only for health and safety of buildings, not quality and durability who is responsible for “protecting owners from neighbouring infringements to the peaceful enjoyment of their property”? If someone wants to build an eight storey building next door to me, as long as it’s healthy and safe that’s okay? We ‘let the market’ control the doing of it? The same for Gezza’s question? @G, the buyer is responsible for selecting and ensuring the quality and durability s/he wants to pay for just as for everything else. @d, the law should provide national standards for intrusions of noise, chemicals, water, loss of sunlight, privacy etc and courts would enforce them. As tradeable rights violations could be contracted with affected parties. I imagine this TPR ‘contracting’ between affected parties will be done through lawyers, who will take the place, and expense, of Councils …? @sf, as I noted, the last thing the loony Left want is to actually fix the housing problems so they will continue and worsen while they pretend to do things. There’s still an awful lot of ‘development’ going on … and someone must be making plenty of bucks at it … Who is that most likely to be? You can only push prices up if you have a monopoly. Land owners and developers don’t unless governments give them one. Been thru these before. @G, the buyer is responsible for selecting and ensuring the quality and durability s/he wants to pay for just as for everything else. Nope. Not good enuf. Minimum standards need to be set, checked and enforced. Otherwise people end up buying badly built shite houses and not being able to afford to fix the damn things, sue the long gone cowboys, or sell them. The market is not sufficient control for this problem. It might be for you millionaires but not for ordinary folk. @G, utter drivelling Lefty rubbish. The market worked like that for centuries everywhere. Try selling a leaky home now. You’ll find hundreds of thousands knocked off the value and price. AND rushing through legislation to enrich a few ‘1st ships families’ with amendments to high country ..leases. you are a tedious,lazy,uninformed,kneejerk troll….I am fast getting sick of humouring your predictable nonsense. So nothing enacted in National’s first term and when it later did it was designed not to impact either total rents paid or tenure review. And the reason for urgency? A total screw-up by the Clark Government that tried to sky-rocket lease rentals and was ruled illegal by the courts. Usual crap from B. Tiresome having to unpick his useless nonsense all the time. you said they had no time to address issues because they had their hands full with the EQ and GFC. blame Labour is your tedious,default postion.Pathetic troll. Look in the mirror. Your own link shows you were spouting complete drivel as usual. the only brain dead idiot is you, who refuses to see how the Nat inspired changes allowed the leaseholders ludicrous profit s.
I’m waiting to hear how National’s Amendment Act in mid 2012 allowed ludicrous profits to leaseholders who sold in 2002. As reported by Ann Bower in 2008. I’m expecting a brain dead idiot to explain that to us. Q-who introduced the relevant Act in 1991 ,that allowed this tragic transfer of wealth to occur? Q-Who addressed the issue and halted this subjective enrichment? God you are fatuous, B. Every time you produce a drivelling idiocy and are hauled up on it you just jump to another. Go play with your dolls. Point deducted for using “fatuous” AGAIN. @G, I’ll use it every time B earns it. Unbelievable. If there was a housing crisis when National took power during the GFC it was a house price collapse. Still, we’ve recovered well and got back on exactly the same horse eh? Why do you think the finance companies collapsed? Let me guess …. Government interference in the ‘money market’ …? Yes, that was the original cause in the USA. However the finance companies were hit by the subsequent collapse in demand and prices for the property developments they were funding. @Al…not all Finance companies were funding property developments-Nathans a good example. 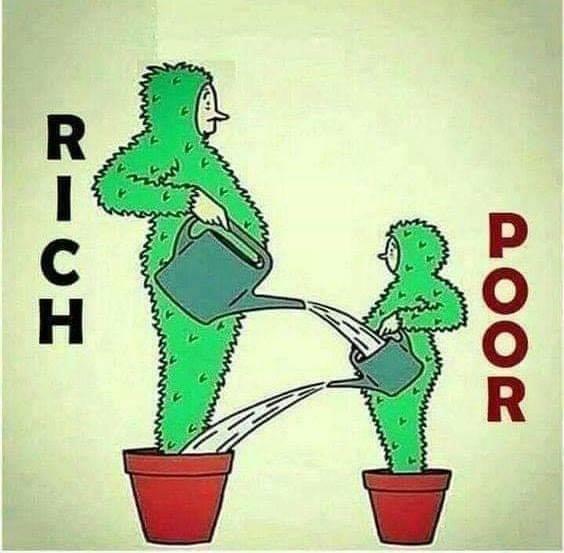 The Ponzi dried up because ‘investors’ stopped feeding the pot. Most developers were never paying the principal or even interest on their loans.They were amortised ,rolled over,but the Hanovers of the world still booked profits and made huge drawings all proven to be at the expense of the conned…i.e the ‘greedy’ investors. Nathans was a business venture that failed as many do. The criminality was funding it via a subsidiary finance company rather than direct investment and then failing properly to inform investors in the finance company. Its failure was unrelated to the GFC other than a coincidence of timing. Such utterances by Judith Collins do not constitute evidence. That would be based on the assumption that government can actually do it cheaper and better. The history of public housing indicates differently. ‘ The history of public housing indicates differently.’…not evident to me…what you got? The history of public housing in Aotearoa New Zealand certainly proves beyond doubt that the government can do it better. Generations who grew up in State Houses during the 40s, 50s and 60s can attest to that. They would have otherwise grown up in private rental slums and many in private rental hovels. For instance: How come in the late 60s, early 70s a combination of State Advances and Group Housing could provide perfectly good, affordable accommodation for families but today a combination of Global Banking Corporations and Private House Builders can’t? That’s the mythology. As is usual with the Left and their worship of the state, the reality is a bit different than Micky Savage carting furniture into new homes. Did state houses make much difference to housing supply?. … all I really wanted to highlight was the strong downward trend over the 90 years from the mid 1880s to the mid 1970s. The only interruption to the trend was in the single inter-censal period from 1916 to 1921. It is more or less what one would expect, as people got wealthier, families got smaller (and, at least late in the period, divorce got more common). Had the state not been building, there isn’t much reason to suppose that – over time, and in the absence of building and land use restrictions – the private sector would not have done so. After all, they had done so in the decades prior to the state housebuilding programme (I was little surprised to see that even over the period encompassing the Great Depression – 1926 to 1936 – the population to dwellings ratio fell). I’d suggest that the burden of proof is really on the advocates of KiwiBuild to show that even very big government-inspired housebuilding projects really make much difference to the overall housing supply situation in the long-term. The two most recent inflections are the post-world-war baby booms. Wow, if that’s the “key graph” you’ve got a shitload of proving to do … I hate to think what the “lesser graphs” must involve? With a myriad of interdependent factors combining to determine ‘Persons per Occupied Dwelling’ over the century 1874 – 1976 – from World War and Depression to Flatting and Birth Control – how do arrive at any correlation with State Housing, let alone causation? ….how do arrive at any correlation with State Housing, let alone causation? That’s a very strange argument to make when what Reddell has done is demonstrate that there is no correlation or causation between State Housing and housing supply. and in any case, the point (again) is that those other factors, whatever they are, are what has driven the slow and steady decline in people per dwelling, rather than State Housing. It’s not a matter of “rather than” State Housing, it’s a matter of “as well as”. I conclude that the housing stock increased and persons per dwelling decreased, since we know that the population increased during that time. What you appear to be saying is that the ‘success’ or otherwise of State Housing is measured somehow by average person’s per dwelling …? Do you mean State Housing should have led to MORE persons per dwelling or LESS in order to be successful? Like 6.1 ppd? Or maybe 0.9ppd? Another lunatic decision by an idiot. First of all there is an oversupply of new build houses in Canterbury and second you can quite easily buy a used 3 bedroom house sub 400k. The background to this is new subdivisions were approved on the basis that there would be some medium density housing as part of it as per council requirements. The subdivision folk got stuck with these unsaleable parcels of land so did deals with house builders, pay for the land when the house sells arrangement. The builder then builds and finds no one wants that sort of a house in Christchurch in a subdivision and they sit empty and then turned into rentals. Along comes a useful idiot like Twyford waving a big fat taxpayer cheque to bail out the property developers he has spent years hating on who were forced into building something folk dont want. I absolutely despair, the people who elected this mob must be struggling to keep the faith. Wouldnt build anything in Christchurch we are over supplied already, I do have 2 very nice 3 bedroom houses for sale for around the 400k mark though, perhaps I should give Twyford a call. I live just around the corner from the empty Mike Greer houses that have been palmed off to pad Twyfords numbers, there is just not the demand for that sort of thing here he should stick to Auckland where there is a problem. Phil has to go. He’s just an ongoing embarrassment. If Jacinda can’t do it, somebody else has to.